Hackers have been busy in finding a ways to Hack Facebook Accounts. But hacking Facebook accounts is not an easy task because Facebook is paying heavenly sum to its security experts and penetration testers to keep user accounts as safe as possible. Earlier, I wrote a funny trick to hack Facebook Account but this time it is not funny but a real working method. Facebook has integrated Three Trusted Friends feature to recover lost passwords. This feature was included to recover Facebook Account but it is exploited by hackers to penetrate into someone’s Facebook Account. 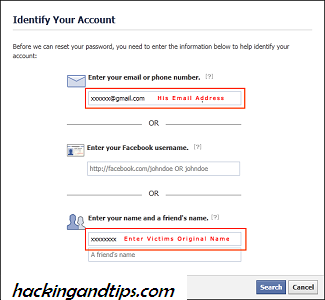 Apart from third party tools its the only possible way to hack Facebook Accounts. It is the major loophole in Facebook security. The Sole purpose of this article is to highlight the loophole in security.We are not responsible if you use it with malicious intentions and get caught ! !